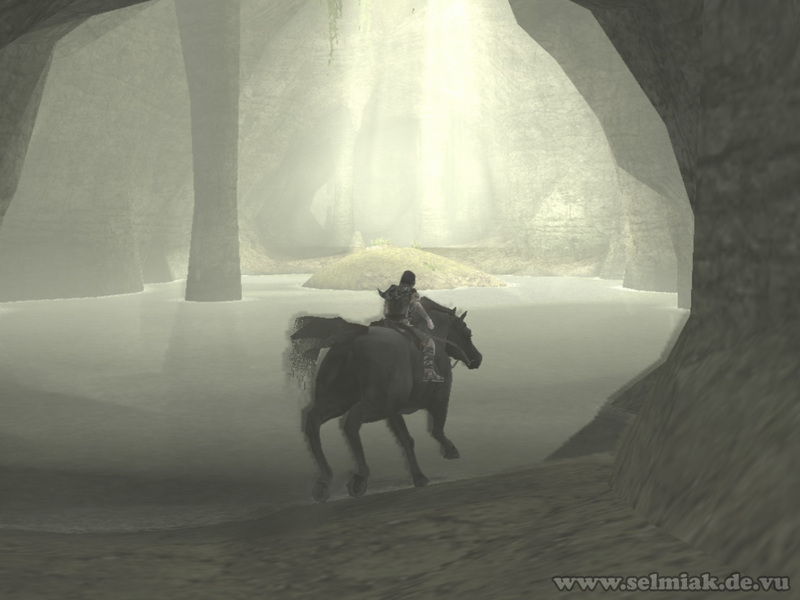 Let's go and find the 14th colossus, ride to the northwestern end of the plateau the temple is on again and cross the canyon at the old and destroyed pillars to the west over the natural dam. As soon as you are over the huge canyon ride to the northwest. Pass the dark clouds from the location of the 9th colossus on the right of them and you will reach a narrow path in the valley of another deep canyon. Ride through this path until the path widens up. 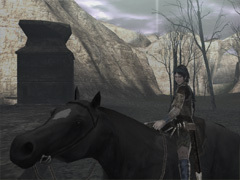 Ride along here to the west until you come to a dead forest that you have to cross in southern direction. After the dead forest there are some old walls and stairs. 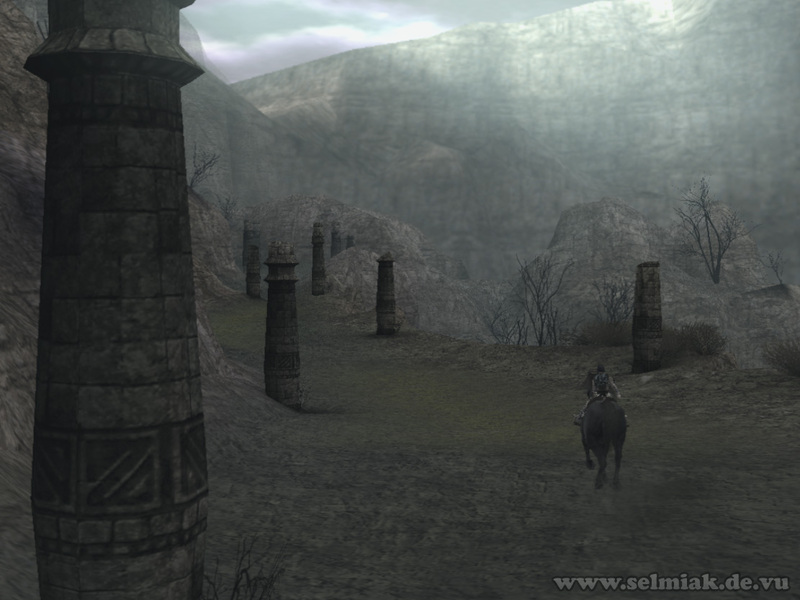 After the stairs you head to the north again, pass along a lot of ancient pillars until you reach a cave. Enter the cave, swim through the water and just get into the cave deeper and deeper. 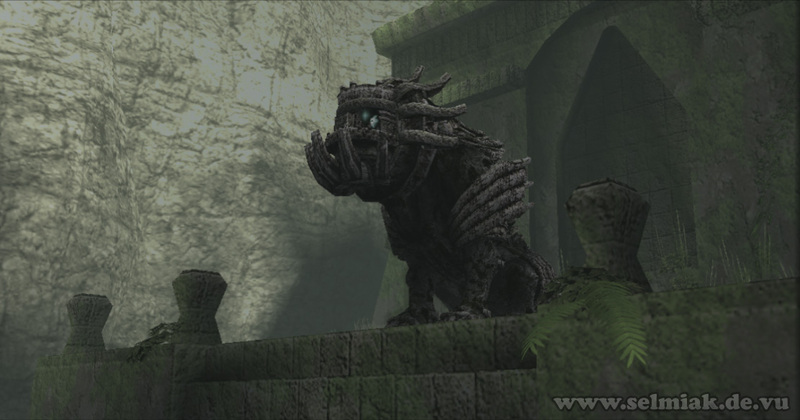 Here the 14th colossus is waiting for you and has planned some mean things with you already. 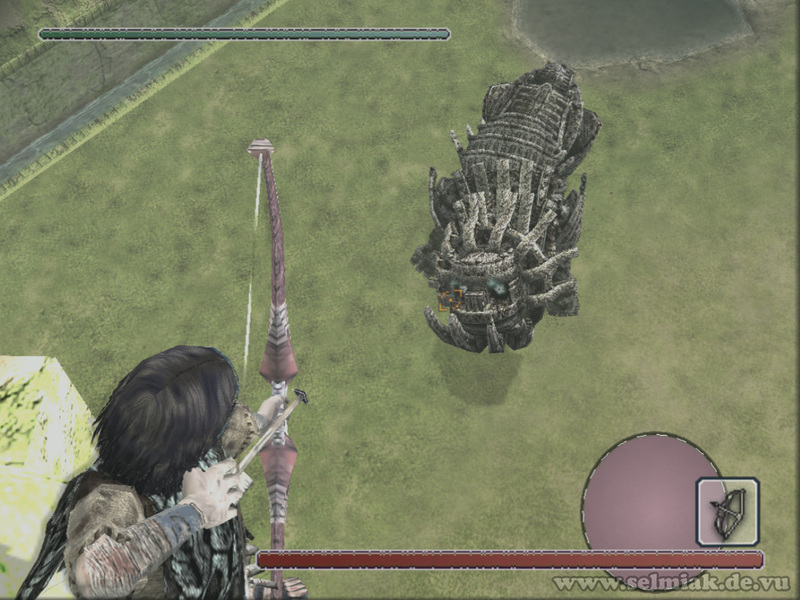 This fight is quite funny once you found out what you have to do to win the fight against the 14th colossus. But first things first, at first you have to find the colossus. So climb down from the gallery you enter the area on. 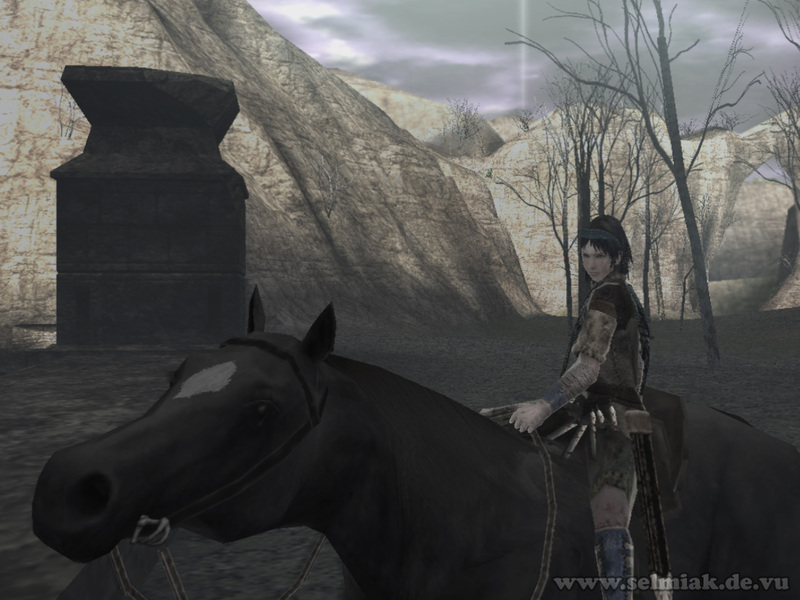 Now get to the left, there are some huge stairs and on top the fourteenth colossus is waiting for you. Luckily this mean colossus looks quite like the 11th colossus but you have to do totally different things to him to beat him. 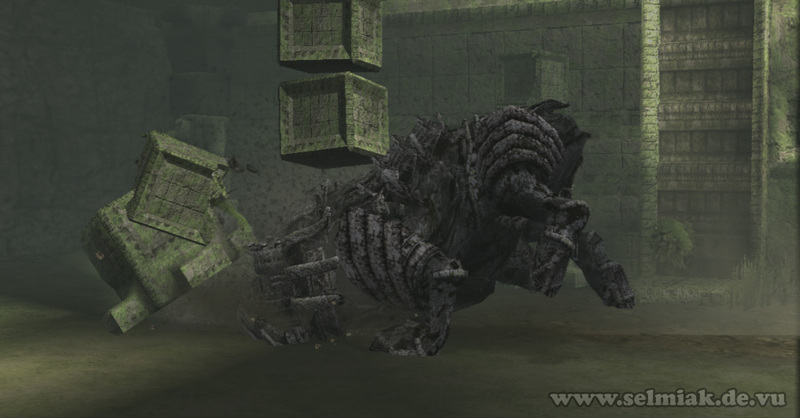 His ramming attacks towards you are more devastating than these of the other small colossus. But he can only tackle you if you are moving on the ground. So you better not move on the ground at all. The best thing to do once the colossus jumped down from his starting position is to climb on the collapsed pillar that is lying around on the ground here. It's the only collapsed pillar around where you meet the colossus so you should find it. Jump to the arch at the back end of the pillar and climb up on it. Jump to an even higher arch from here and from there to yet another arch that is a bit lower in height but built in the same direction. 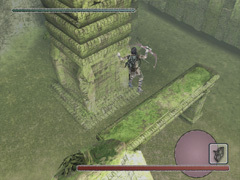 From this third arch you finally jump to the huge pillar at its end and climb up on it until you stand on the pillar. 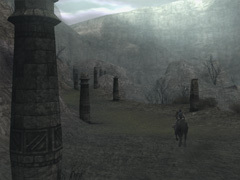 Now crouch and hold on tight, as the 14th colossus will ram into the pillar. Now you have to provoke the colossus to make him angry. Do so by shooting him with an arrow onto his colossal body. 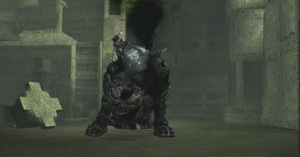 The fourteenth colossus starts raging all over the place and rams into the pillar you are standing on and makes the pillar collapse. Feels funny, but now you can use the collapsed pillar to jump to the next arch. 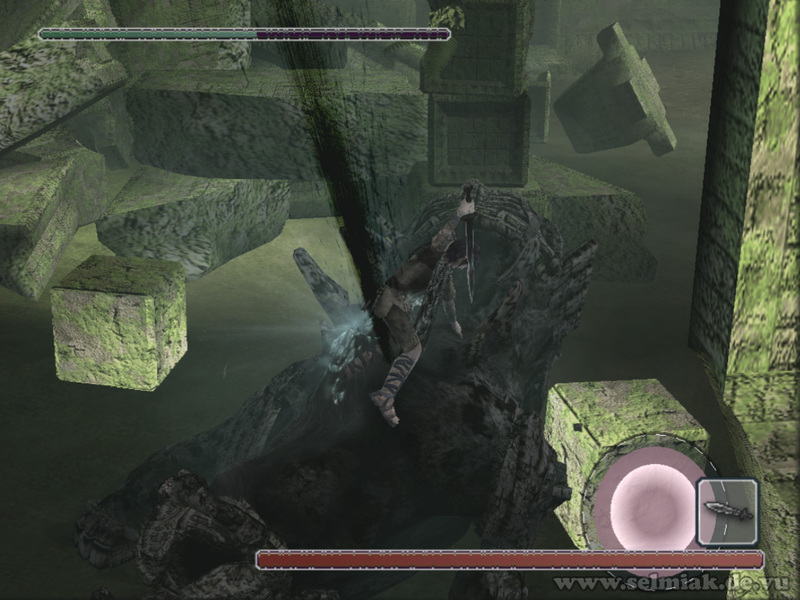 Play the game of the pillars and the colossus collapsing them some more until you finally reach the square building. 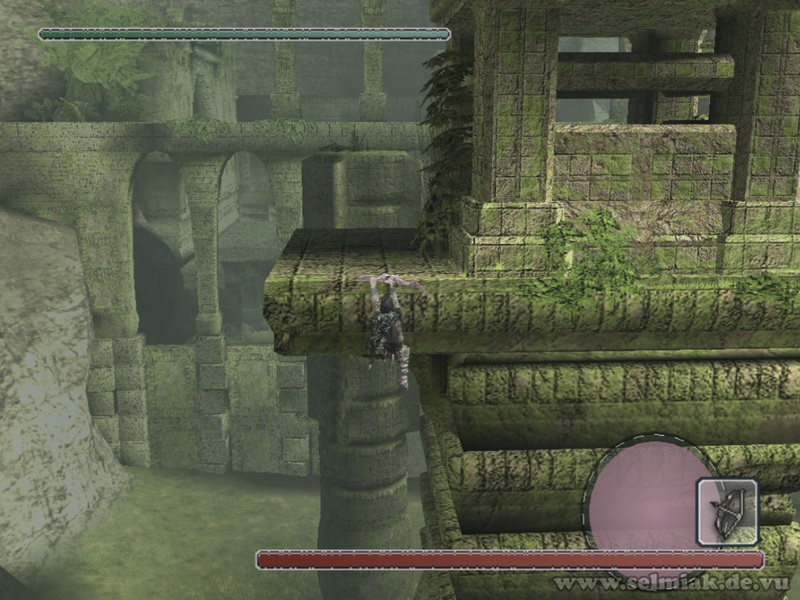 You cannot climb onto the building directly so climb around to the side and climb from the side to the platform on the backside of the building (backside relative to the direction you came from) and run really fast on the platform to jump to the next and last pillar. 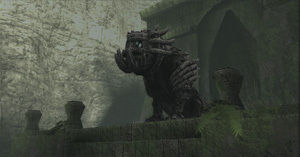 Once you made the colossus collapse this last pillar too it will crash into a nice old wall and destroy it in the act. Now you are below the area where you entered this place. Climb back up to the gallery on the wall opposite of the wall you just crashed with the pillar. 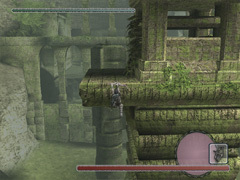 Shoot the fourteenth colossus again with arrows from up here and in his rage the colossus will destroy a supporting column under the gallery. And the whole gallery comes down on him. And this is good as his shell is now cracked open and you can finally reach his weak point. Now it is quite easy to hurt him, you just have to get onto his back. This is not that easy, but just read on. You climb on one of the collapsed pillars and just wait until he smashes his head into the pillar. Because he is unprotected now he is very dizzy after smashing his head straight into massive stone. Use this to your advantage and smash your sword into his unprotected back. Once he starts running around don't grab onto him, just let go and climb up another pillar really fast. As soon as he is dizzy from his ramming again just jump on him again and finish the 14th colossus him off.